As the 5th largest agricultural exporter in the world having a sizeable population of large horsepower farm equipment, Brazil is an important market for Camso. “This is a next generation move for us. The market has potential and we believe our CTS product is a perfect aftermarket bolt on solution for farmers looking to maximize the overall efficiency and quality of work of a combine,” says Martin Lunkenbein, Business Line Executive Director, Systems - Agriculture. “Our OEM customers are also looking to set up shop in this region. We want to make sure we can support their track and track system development needs in Brazil,” adds Lunkenbein. 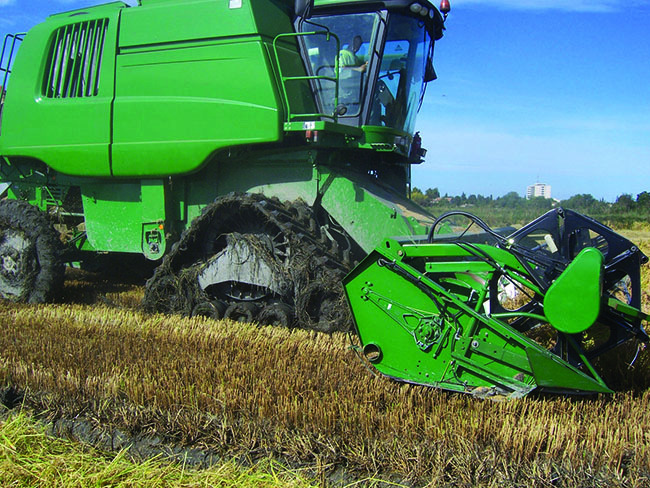 Agro Maquinas is an ideal partner to help expand Camso's Agricultural manufacturing operations. They have a long history in the region and have built a valuable knowledge of the industry after their 35 years of business. They have the people and teams to source components and manufacture the system locally as well as promote the product through an already established dealer and distribution network. Conversion Track Systems will be ready in time for Brazil's 2016 harvest. “Wet weather plays a large factor in a growers' ability to get into the field and harvest their crop when its ready. The CTS is a low maintenance solution offering more traction and larger footprint than a dual tire set up. The benefit: a reduction in ground pressure by as much as 60%, less field damage and ultimately a better yield. We're very excited to team up with Agro Maquinas to bring this solution to market,” concludes Lunkenbein. To help generate awareness of this new partnership, Camso and Agro Maquinas will be present at the Agrishow on April 25-29 in Ribeirão Preto, Sao Paulo at booth # E9d1. The booth will have on-site Camso engineers and product displays so visitors and dealers alike can gain first hand knowledge of the features and benefits of Camso's Conversion Track System on a combine.